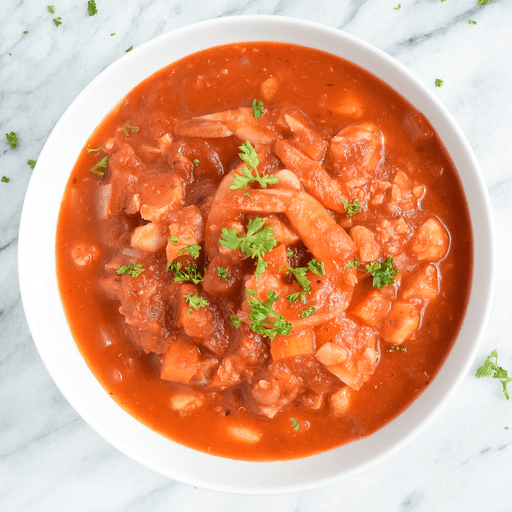 With a warm, comforting tomato base, succulent shrimp and perfectly-cooked fish, this protein-packed Seafood Stew is a delicious way to take the chill away. 1. Heat oil in a 6-quart shallow Dutch oven or saucepot over medium heat. Add onion and carrots. Stirring occasionally, cook until tender, about 7 minutes. Add garlic, bay leaf, Italian seasoning and crushed red pepper. Cook for about 1 minute or until garlic becomes fragrant. 2. Stir in chicken stock and tomatoes. Reduce heat to low. Cover and simmer for 10 minutes. Return to a boil over medium-high heat. Gently stir in shrimp and white fish. Cover and cook for 10 minutes or until fish flakes easily with a fork. Discard bay leaf and season with salt and pepper. 3. To serve, ladle into soup bowls and sprinkle with parsley, optional. Use tilapia, halibut or haddock in place of cod.